Alanya , formerly Alaiye, is a beach resort city and a component district of Antalya Province on the southern coast of Turkey, in the countrys Mediterranean Region, 138 kilometres (86 mi) east of the city of Antalya. As of Turkeys 2010 Census, the city had a population of 98,627, while the district that includes the city and its built-up region had an area of 1,598.51 km2 and 248,286 inhabitants. Because of its natural strategic position on a small peninsula into the Mediterranean Sea below the Taurus Mountains, Alanya has been a local stronghold for many Mediterranean-based empires, including the Ptolemaic, Seleucid, Roman, Byzantine, and Ottoman Empires. Alanyas greatest political importance came in the Middle Ages, with the Seljuk Sultanate of Rum under the rule of Alaeddin Kayqubad I, from whom the city derives its name. His building campaign resulted in many of the citys landmarks, such as the Kizil Kule (Red Tower), Tersane (Shipyard), and Alanya Castle. The Mediterranean climate, natural attractions, and historic heritage make Alanya a popular destination for tourism, and responsible for nine percent of Turkeys tourism sector and thirty percent of foreign purchases of real estate in Turkey. Tourism has risen since 1958 to become the dominant industry in the city, resulting in a corresponding increase in city population. 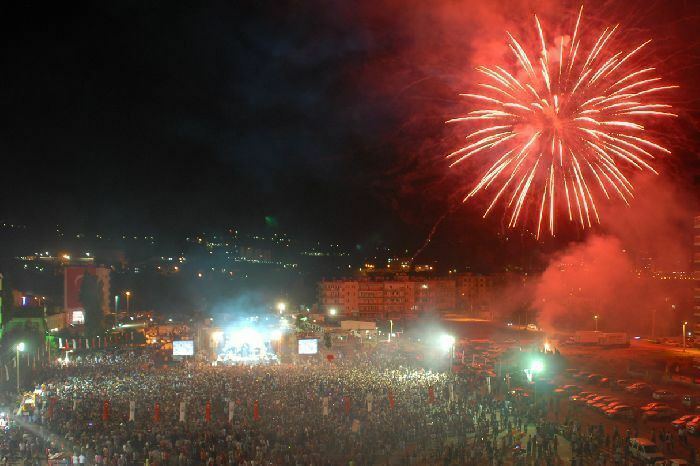 Warm-weather sporting events and cultural festivals take place annually in Alanya. In 2014 Mayor Adem Murat Yucel, of the Nationalist Movement Party unseated Hasan Sipahioglu, of the Justice and Development Party, who had previously led the city since 1999. Finds in the nearby Karain Cave indicate occupation during the Paleolithic era as far back as 20,000 BC, and archeological evidence shows a port existed at Syedra, south of the modern city, during the Bronze Age around 3,000 BC. A Phoenician language tablet found in the district dates to 625 BC, and the city is specifically mentioned in the 4th-century BC Greek geography manuscript, the periplus of Pseudo-Scylax. The castle rock was likely inhabited under the Hittites and the Achaemenid Empire, and was first fortified in the Hellenistic period following the areas conquest by Alexander the Great. Alexanders successors left the area to Ptolemy I Soter after 323 BC. His dynasty maintained loose control over the mainly Isaurian population, and the port became a popular refuge for Mediterranean pirates. The city resisted Antiochus III the Great of the neighboring Seleucid kingdom in 199 BC, but was loyal to the pirate Diodotus Tryphon when he seized the Seleucid crown from 142 to 138 BC. His rival Antiochus VII Sidetes completed work in 137 BC on a new castle and port, begun under Diodotus. The Roman Republic fought Cilician pirates in 102 BC, when Marcus Antonius the Orator established a proconsulship in nearby Side, and in 78 BC under Servilius Vatia, who moved to control the Isaurian tribes. The period of piracy in Alanya finally ended after the citys incorporation into the Pamphylia province by Pompey in 67 BC, with the Battle of Korakesion fought in the citys harbor. Isaurian banditry remained an issue under the Romans, and the tribes revolted in the fourth and fifth centuries AD, with the largest rebellion being from 404 to 408. With the spread of Christianity Coracesium, as it was called, became a bishopric. Its bishop Theodulus took part in the First Council of Constantinople in 381, Matidianus in the Council of Ephesus in 431, Obrimus in the Council of Chalcedon in 451, and Nicephorus (Nicetas) in the Third Council of Constantinople in 680. Coracesium was a suffragan of the metropolitan see of Side, the capital of the Roman province of Pamphylia Prima, to which Coracesium belonged. It continued to be mentioned in the Notitiae Episcopatuum as late as the 12th or 13th century. No longer a residential bishopric, Coracesium is today listed by the Catholic Church as a titular see. Islam arrived in the 7th century with Arab raids, which led to the construction of new fortifications. The area fell from Byzantine control after the Battle of Manzikert in 1071 to tribes of Seljuk Turks, only to be returned in 1120 by John II Komnenos. Following the Fourth Crusades attack on the Byzantines, the Christian Armenian Kingdom of Cilicia periodically held the port, and it was from an Armenian, Kir Fard, that the Turks took lasting control in 1221 when the Anatolian Seljuk Sultan Alaeddin Kayqubad I captured it, assigning the former ruler, whose daughter he married, to the governance of the city of Aksehir. Seljuk rule saw the golden age of the city, and it can be considered the winter capital of their empire. Building projects, including the twin citadel, city walls, arsenal, and Kizil Kule, made it an important seaport for western Mediterranean trade, particularly with Ayyubid Egypt and the Italian city-states. Alaeddin Kayqubad I also constructed numerous gardens and pavilions outside the walls, and many of his works can still be found in the city. These were likely financed by his own treasury and by the local emirs, and constructed by the contractor Abu Ali al-Kattani al-Halabi. Alaeddin Kayqubad Is son, Sultan Giyaseddin Keyhusrev II, continued the building campaign with a new cistern in 1240. At the Battle of Kose Dag in 1242, the Mongol hordes broke the Seljuk hegemony in Anatolia. Alanya was then subject to a series of invasions from Anatolian beyliks. In 1293, the Karamanid dynasty took control after Mecduddin Mahmud conquered the city, but their rule was intermittent. Lusignans from Cyprus briefly overturned the then ruling Hamidid Dynasty in 1371. The Karamanids sold the city in 1427 for 5,000 gold coins to the Mamluks of Egypt for a period before General Gedik Ahmed Pasha in 1471 incorporated it into the growing Ottoman Empire. The city was made a capital of a local sanjak in the eyalet of Icel. The Ottomans extended their rule in 1477 when they brought the main shipping trade, lumber, then mostly done by Venetians, under the government monopoly. On September 6, 1608, the city rebuffed a naval attack by the Order of Saint Stephen from the Republic of Venice. Trade in the region was negatively impacted by the development of an oceanic route from Europe around Africa to India, and in the tax registers of the late sixteenth century, Alanya failed to qualify as an urban center. In 1571 the Ottomans designated the city as part of the newly conquered province of Cyprus. The conquest further diminished the economic importance of Alanyas port. 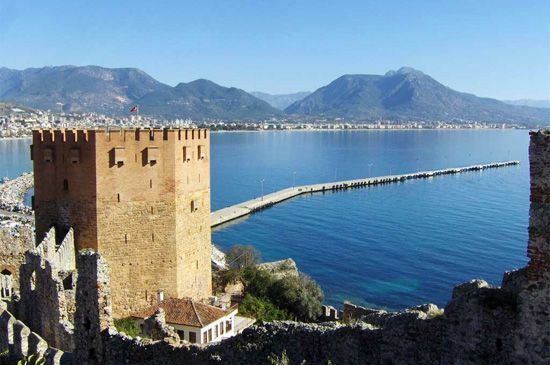 Traveler Evliya Celebi visited the city in 1671/1672, and wrote on the preservation of Alanya Castle, but also on the dilapidation of Alanyas suburbs. The city was reassigned in 1864 under Konya, and in 1868 under Antalya, as it is today. During the 18th and 19th centuries numerous villas were built in the city by Ottoman nobility, and civil construction continued under the local dynastic Karamanid authorities. Bandits again became common across Antalya Province in the mid-nineteenth century. After World War I, Alanya was nominally partitioned in the 1917 Agreement of St.-Jean-de-Maurienne to Italy, before returning to the Turkish Republic in 1923 under the Treaty of Lausanne. Like others in this region, the city suffered heavily following the war and the population exchanges that heralded the Turkish Republic, when many of the citys Christians resettled in Nea Ionia, outside Athens. The Ottoman census of 1893 listed the number of Greeks in the city at 964 out of a total population of 37,914. Tourism in the region started among Turks who came to Alanya in the 1960s for the alleged healing properties of Damlatas Cave, and later the access provided by Antalya Airport in 1998 allowed the town to grow into an international resort. Strong population growth through the 1990s was a result of immigration to the city, and has driven a rapid modernization of the infrastructure. Located on the Gulf of Antalya on the Anatolian coastal plain of Pamphylia, the town is situated between the Taurus Mountains to the north and the Mediterranean Sea, and is part of the Turkish riviera, occupying roughly 70 kilometres (43 mi) of coastline. From west to east, the Alanya district is bordered by the Manavgat district along the coast, the mountainous Gundogmus inland, Hadim and Taskent in the Province of Konya, Sariveliler in the Province of Karaman, and the coastal Gazipasa district. Manavgat is home to the ancient cities of Side and Selge. East of the city, the Dim River flows from the mountains in Konya on a south-west route into the Mediterranean. The Pamphylia plain between the sea and the mountains is an isolated example of an Eastern Mediterranean conifer-sclerophyllous-broadleaf forest, which include Lebanon Cedar, evergreen scrub, fig trees, and black pine. The Alanya Massif refers to the area of metamorphic rocks east of Antalya. This formation is divided into three nappes from lowest to highest, the Mahmutlar, the Sugozu, and the Yumrudag. The similar lithology extends beneath the city in a tectonic window. Bauxite, an aluminum ore, is common to the area north of city, and can be mined. The town is divided east–west by a rocky peninsula, which is the distinctive feature of the city. The harbor, city center, and Keykubat Beach, named after the Sultan Kayqubad I, are on the east side of the peninsula. Damlatas Beach, named for the famous "dripping caves", and Kleopatra Beach are to the west. The name "Cleopatra" possibly derives from either the Ptolemaic princess visit here or the areas inclusion in her dowry to Mark Antony. Ataturk Bulvari, the main boulevard, runs parallel to the sea, and divides the southern, much more touristic side of Alanya from the northern, more indigenous side that extends north into the mountains. Cevre Yolu Caddesi, another major road, encircles the main town to the north. Alanyas culture is a subculture of the larger Culture of Turkey. The citys seaside position is central to many annual festivals. These include the Tourism and Arts Festival, which marks the opening of the tourism season from at the end of May or beginning of June. At the opposite end of the season, the Alanya International Culture and Art Festival is held in the last week of May, and is a notable Turkish festival. Other regular festivals include the Alanya Jazz Days, which has been held since 2002 in September or October at the Kizil Kule, which is otherwise home to the municipal ethnographic museum. The Jazz Festival hosts Turkish and international jazz musicians in a series of five free concerts. The Alanya Chamber Orchestra, formed of members of the Antalya State Opera and Ballet, gave its inaugural performance on December 7, 2007. The International Alanya Stone Sculpture Symposium, begun is 2004, is held over the month of November. The Alanya Documentary Festival was launched in 2001 by the Alanya Cinematheque Society and the Association of Documentary Filmmakers in Turkey. Onat Kutlar, Turkish poet and writer, and founder of the Istanbul International Film Festival was born in Alanya, as was actress Sema Onur. 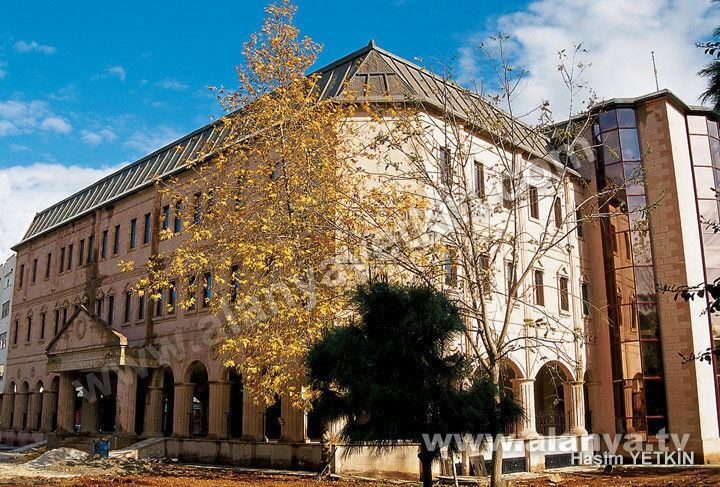 Ataturks visit to Alanya is also celebrated on its anniversary each February 18, centered on Ataturks House and Museum. The Alanya Museum is home to archaeology found in and around the city, including a large bronze Hercules statue, ceramics, and Roman limestone ossuaries, as well as historic copies of the Quran. European residents of Alanya also often celebrate their national holidays, such as Norwegian Constitution Day, and the city set up a Christmas market in December 2010. Iranians also celebrate the Persian New Year, Nevruz, in Alanya. 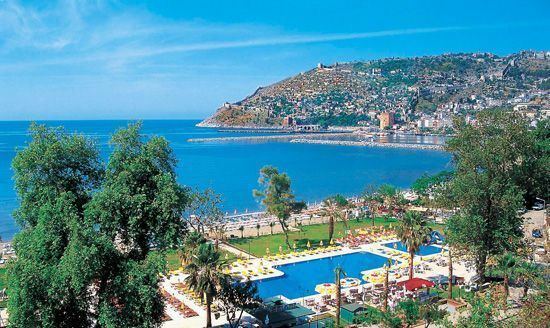 The tourist industry in Alanya is worth just under 1.1 billion euros per year, and is therefore the principal industry. The area is further known for its many fruit farms, particularly lemons and oranges, and large harvests of tomatoes, bananas and cucumbers. About 80,000 tonnes of citrus fruits were produced in 2006 across 16,840 hectares (41,600 acres). The greengage plum and the avocado are increasingly popular early season fruits where citrus fruits are becoming unprofitable.